In an effort to save their marriage, Anna and Ben form a band and use their arguments to write songs. Turning a bad relationship into inspiration for music has worked for Taylor Swift, Sam Smith, and Adele, so why can't it work for this couple? 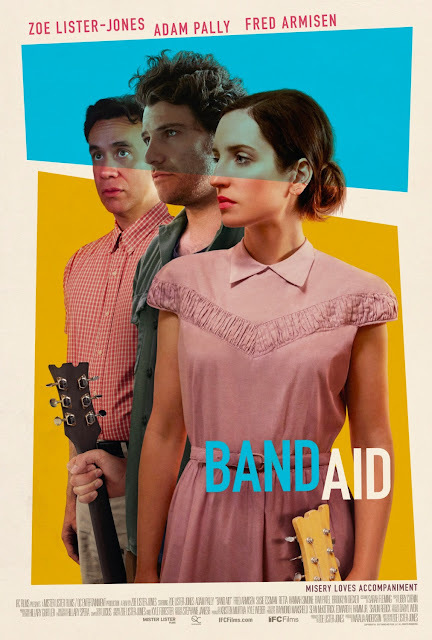 Zoe Lister-Jones is the writer, director, producer, and star of "Band Aid," a quirky indie comedy with dramatic undertones... as if there is any other kind of indie comedy. Lister-Jones plays Anna, who is married to Ben, played Adam Pally. Anna and Ben are constantly at odds with one another and bicker over the most trivial things. While at the birthday party of Anna's godson, she and Ben start messing around with a couple of toy instruments. This gives them the idea to start writing songs together. About what, you may ask? They intend to use their songwriting and music as a form of therapy in their marriage. Actually... when we think about it, it was never really the music that made them stop fighting. It was the potential for having success while doing something creative that really stopped their fighting. It was when Anna thought their band could turn into something more than farting around in their garage that she was happy enough to stop fighting. Or maybe she was happy because her husband finally got up off the couch, pried himself away from his video games and his marijuanas, and decided to do the damn dishes. Who really knows, it all happened around the same time they formed their group. Viewers should be warned, a good 50-60% of this film contains nothing more than Anna and Ben yelling at each other over and over, and their fights get progressively worse. "Band Aid" begins with a cold start and everything that happens before the title screen is a bit rough. There is the occasional witticism thrown in here and there, but it's mostly just two people arguing about all of their problems big and small. Luckily, shortly after the title, Fred Armisen shows up and offers some very funny moments to sustain the audience through the contention. For us, the best moments are when Armisen's character Dave, Anna and Ben's weird, quirky neighbor, eventually joins their band as the drummer. Unfortunately, he has a relatively small role. Can we get a Dave spin-off story?? Since this is a movie about the power of music, we hoped it would have some good tunes to go along with the epic arguments. When we've watched other music-centric movies like John Carney's "Once," "Begin Again," or "Sing Street," we've left those films with songs stuck in our heads wanting to hear them again and again. At the end of "Band Aid," we struggled to remember a single tune or lyric and didn't really care to seek out its soundtrack. There are a few laughs throughout the film in between all of the yelling and screaming, some minor chuckles and some big belly laughs. The screenplay does a good job showing a realistic look at a rocky marriage, though it does wind up with a message that basically says couples fight because men and women are biologically different and handle emotions in different ways. It also says fights are a part of a relationship and people just need to accept it. "Band Aid" has some good and some not so good. Luckily, Lister-Jones and Pally have great chemistry (even while they are yelling at each other) and Fred Armisen is hilarious, so you most likely won't be bored. If you're newly married, however, you may want to wait a few years until you watch this movie.